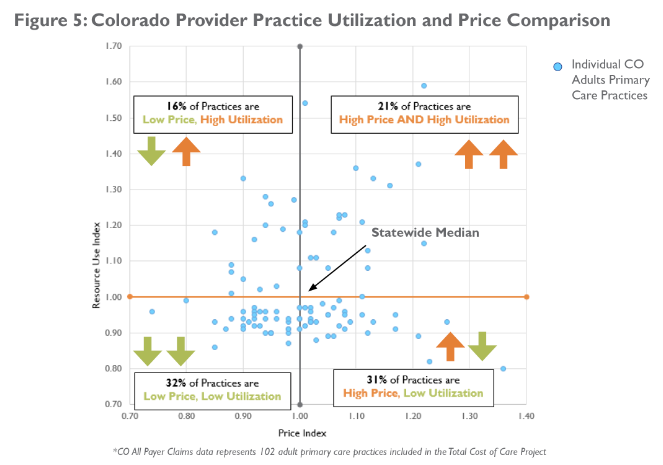 A new multi-state study shows Colorado could save more than $48 million annually across 102 adult primary care practices if prices for health care services were closer to the average across Colorado’s participating practices. Results found that Colorado’s total costs across all health care services were 17% higher than other states, and substantially higher with respect to outpatient services (30% higher). Colorado’s overall high costs were driven by both higher use of health care services and higher prices for those services when compared to other states. As health care costs continue to rise in Colorado and across the nation, it’s essential to better understand what’s driving those increases in order to make positive changes. There are a number of reasons why costs may vary both within one state and among several, including the health of the population, how often people see a health care provider or fill prescriptions (also known as utilization), and the prices of those services. The Total Cost of Care project, funded by the Robert Wood Johnson Foundation and led by the Network for Regional Healthcare Improvement, is the first of its kind to measure those factors in a standardized way across multiple states. Center for Improving Value in Health Care (CIVHC) participated in the study on behalf of Colorado using claims data from the Colorado All Payer Claims Database (CO APCD). 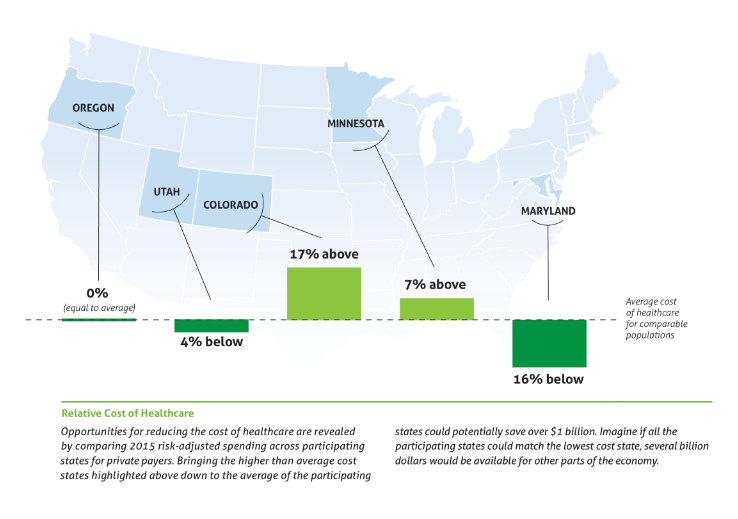 Across the participating states – Colorado, Oregon, Utah, Minnesota and Maryland – results of the national report show that the ways people access health care and the price tag associated differ significantly, resulting in very different per patient total costs from state to state. In Colorado, across all categories of services analyzed (Hospital Inpatient, Outpatient, Professional and Pharmacy), higher total costs were driven more by patients using health services more frequently than the price of those services compared to other states, although both were a factor. Of the four service categories analyzed, Colorado’s costs were higher than any other state for three out of the four: Outpatient (30% higher), Inpatient (16% higher), and Pharmacy (24% higher). Professional services were the only category where Colorado fared better than other states, although costs were still higher than two participating states. 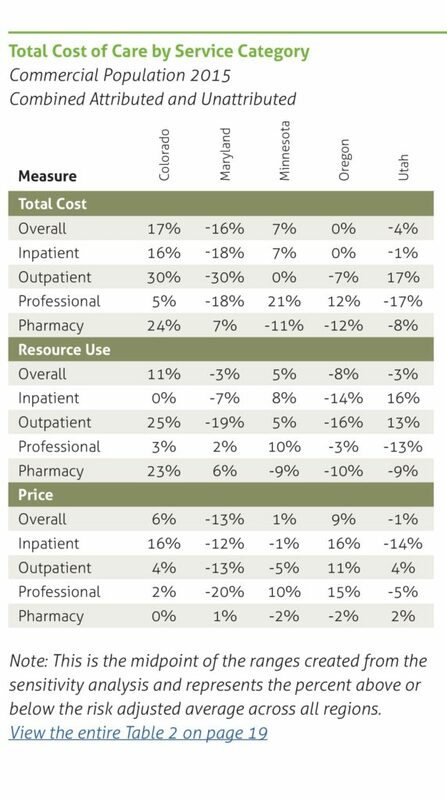 Higher costs in Outpatient and Pharmacy appear to be driven mostly by higher utilization whereas Inpatient costs are driven almost solely by above average prices. To address relatively high costs in Colorado, it is important to understand which areas of the state have the biggest opportunities are for change. 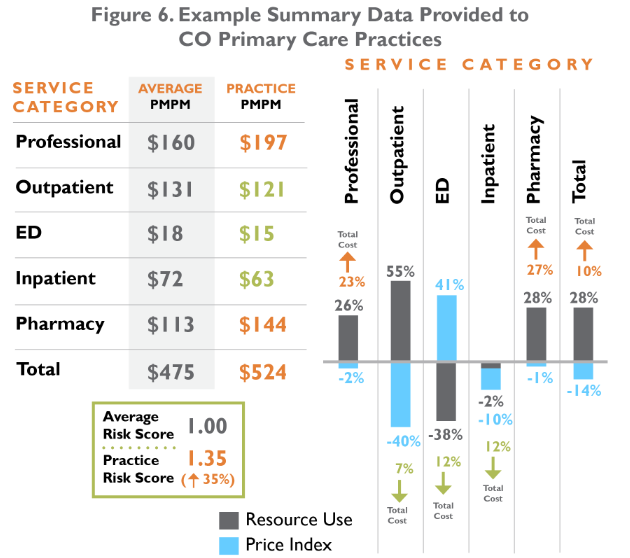 Within Colorado, total costs varied substantially by Colorado Division of Insurance (DOI) geographic rating area and ranged from $390-$591 Per Member Per Month (PMPM) across the 102 practices analyzed. 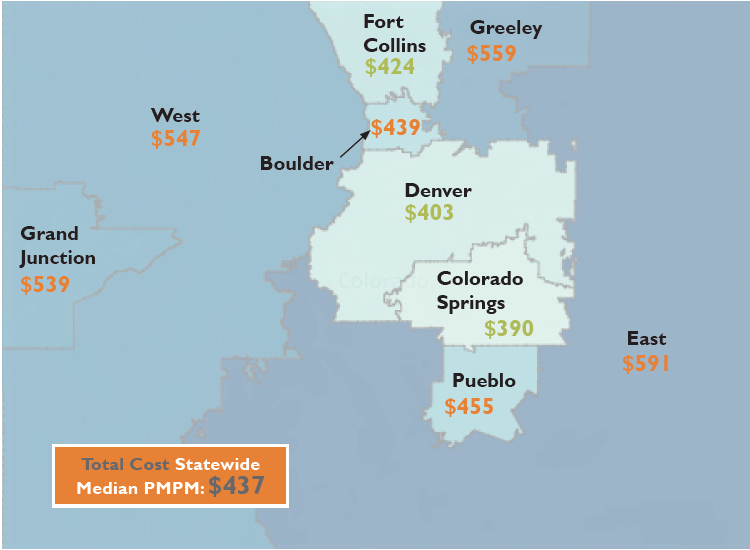 Six regions in Colorado had higher PMPM total costs than the statewide average. The East and Greeley regions had the two highest risk-adjusted PMPM costs in the state, driven by both higher utilization and higher prices. Grand Junction and the West regions had the third and fourth highest total costs respectively, primarily driven by higher prices, as utilization in those areas is either lower than or nearly equal to the statewide average. 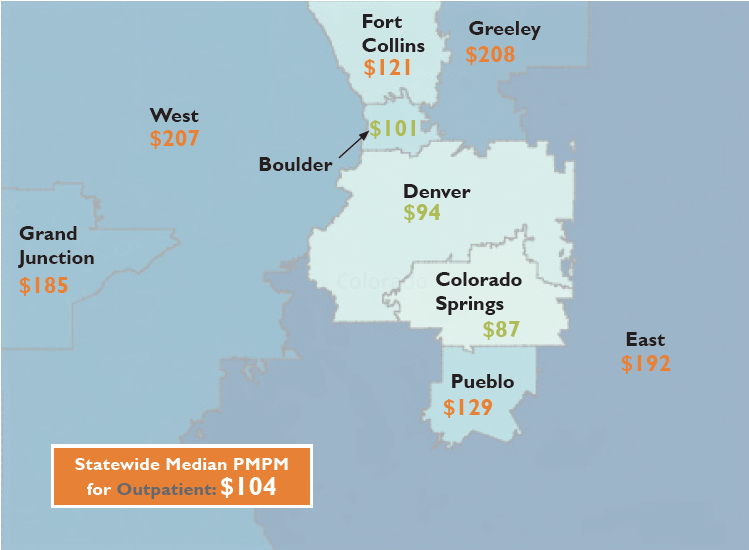 Colorado’s outpatient total cost, which exceeded the five state average by the largest amount at 30% above the multi-state benchmark, showed variation across Colorado DOI regions between $87-$208 PMPM. All regions except for Boulder, Denver, and Colorado Springs were above the statewide median ($104 PMPM). Greeley, West, East and Grand Junction regions were top four for highest outpatient costs, driven by both higher than average utilization and higher than average prices in those areas. As part of this project, CIVHC also provided detailed practice-level reports to the 102 adult primary care physician practices and 24 pediatric practices included in the Colorado analysis. According to the CIVHC analysis, only 32% of the adult primary care practices in the study fell into the low cost and low utilization category, leaving 68% of practices with opportunities for cost saving improvements in price, service use, or both. 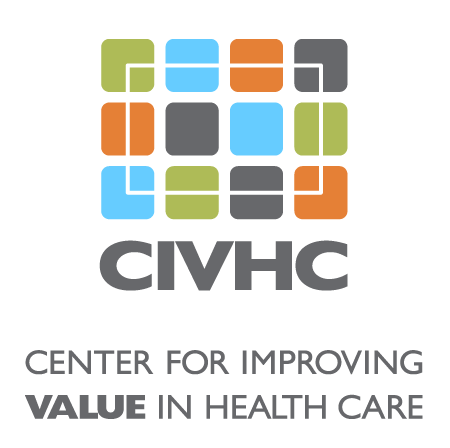 In the coming year, CIVHC will add nationally endorsed quality measures to the practice-level reports, enabling a variety of stakeholders to evaluate performance on both total cost and quality of care. CIVHC also plans to work with providers to make summary cost and utilization information contained in the practice-level reports available publicly at www.civhc.org. An important first step towards practice-level quality reporting is the already publicly available quality measures interactive report on CIVHC’s website. Also available are interactive cost of care reports and utilization reports that show trends in costs and utilization across Colorado across the Medicaid, Medicare Advantage and Commercially insured populations. For more information about the Total Cost of Care project, visit www.civhc.org, or contact us at info@civhc.org.